ATLANTA— The Braves are in hot pursuit of Toronto starter A.J. Burnett. The Braves are clearly in desperate need of pitching and Burnett is coming off a season in which he went 18 – 10, with a career high 221 1/3 innings pitched. After the collapse of Smoltz, Hudson, and Glavine during the first half of the 2008 season, the Braves basically disappeared from the baseball map. The remaining pitching rotation was “anchored” by rookie Jair Jurrjens. Jurrjens turned into a wonderful find for the Braves this year, but he is not the guy you want anchoring your rotation at this point (in my opinion). I envision him long-term being a better 2 or 3 starter. The Braves need power and presence at the top of their rotation- and these are the things A.J. Burnett seems to offer. However, I am not completely sold. While Burnett’s 2008 season was really good, his past is checkered. He is extremely injury-prone. 2008 was only the second season in his 10 year career that he started more than 30 games. It was only the third with 200 innings. The Braves have had their share of injury-prone top-of-the-rotation starters in recent years (Smoltz, Hudson, Hampton, etc.). No sense going overboard to get another one. I will not complain if the Braves ultimately sign him. However, the price has to be right in my view. A 5 year contract is not worth the risk. Something reasonably priced in the 3 to 4 year range would be more ideal. An offer on this level might put the Braves out of the running, as Burnett is being pursued by the Red Sox and others. But if Burnett goes elsewhere for a 5 year deal, I think it will turn out similar to the Peavy trade that never was- it might prove to be the best signing the Braves DID NOT make this off-season. I would love to add Burnett if I could have some kind of guarantee that he would stay healthy. He is the JD Drew of pitchers. If he is healthy, you know what you can get. If he is hurt, he is the one of the better pitchers on the DL. 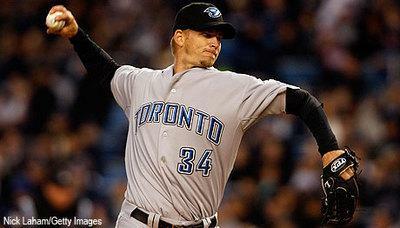 In my opinion, I would still pursue Jake Peavy if I were Frank Wren. Agreed he is the JD Drew of pitchers. And I think that makes him slightly over-rated. Though perhaps not as over-rated as JD Drew- that guy has had one good season in his life (and that one wasn’t that great). But if they get Burnett on a reasonable deal (3 years, good price), then I won’t complain. A Vazquez, Burnett, and Jurrjens top 3 would be very serviceable, provided they are healthy. Not an overwhelming one, but solid nonetheless.